I blogged about Work Jobs back in July and it is something that I have a true passion and love for! If you aren't sure what work jobs are you will want to check it out! Another important point about work jobs is there needs to be beginning and a clear ending. On Pinterest you will find lots of busy bag ideas but the majority of those are playing and don't really have a clear ending, which is something you need to avoid! I wanted to give you some ideas of work jobs you can make with things that you probably already have in your classroom or home! I usually took a picture of what I wanted the student to do, laminated it and then hot glued it to the top of my containers. The lamination makes it EASY to take the pictures off once you want to switch work jobs. Pop Beads: Depending on your student they can take them apart or put them together. Students can put together the lego's or take them apart! Once students have mastered putting the 1 inch blocks together mix up the blocks and have them put the towers together based on colors. 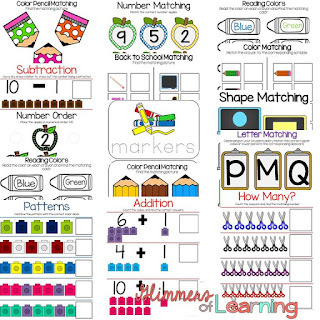 You can also make a pattern that the students should duplicate. I got some medicine containers (FREE from Meijer) and the student had to put one mini eraser and/or counters into each day spot. I switched erasers and/or counters for different holidays or seasons. I took an old (washed) Parmesan Cheese container and depending on the age and ability you can have them put in poker chips, small beads, Q-tips (through the circle holes), or tooth picks. I don't have a picture of it but I also used washed icing containers, cut a circle hole in the top and the students put marble into it! That was a favorite for my students! When I got new students and wasn't sure of their ability to do tasks on their own these are always good ones to start with! I just created a Back to School Work Jobs packet that can be found on TPT at my store! All you'll have to do is print, laminate, cut some pieces and add velcro and you will have 31 work jobs! Check it out it's on sale August 3rd-4th! Here are just a few of the many work jobs that you will get in the Back to School Packet that I created! I plan on blogging about different color sorting and color work jobs on Wednesday! Hope that I've got your mind turning for ideas you can use in your classroom! I love reading your blog Angie! You have wonderful ideas that teachers can apply immediately. Thanks Allison!! I am having a great time with it right now!